Tatianna Lewis is no stranger to creating art — the 25-year-old self-taught artist and Milton resident started painting in 2012. But @totsoartsy, the Instagram account dedicated to her work, is a much newer installment (the earliest post dates back to July 1), its creation owing to a desire to branch out and create more work throughout this past year. “I figured with my newfound dedication to my own artwork, I should show it more,” Lewis said. The artist spoke to the Globe about identity, inspiration, and Instagram Stories. Q. What spurred your newfound dedication to your art? Was there a turning point that inspired the recent burst in artmaking? A. It’s hard to put my finger on what inspired it. But I think it might have something to do with myself, and coming to terms with calling myself an artist, because that was never something I was comfortable doing. When my mom would introduce me, she says, “This is my daughter, the artist.” And I struggled to accept that and feel confident enough to call myself an artist. I feel like now in my life, in the place that I am in my life, I’m OK with that. I’m an artist. That’s who I am, and that’s what I do. That’s what I love. That confidence kind of helped me nudge my art along. Q. What role does identity play in your art? A. Oh my gosh, it plays a huge role. 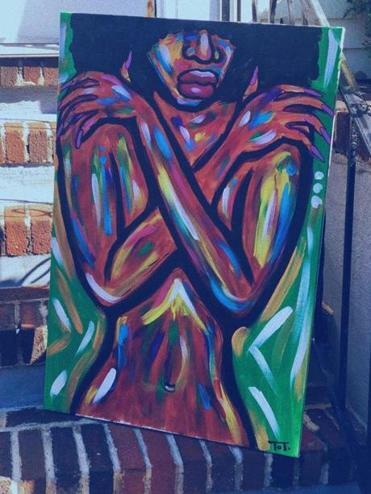 I feel like it’s my place and my duty to depict my identity and the identity of other black women and women of color in my art, so that’s what I tend to paint. And I think that just being able to look at us, look at our beauty and look at everything that represents us in a work of art is one avenue to open up different people’s eyes to what our stories are, what our struggles are, and the beauty in it. Q. How would you describe your creative process, from your inspiration through the execution of a piece? A. I think Instagram plays a major role in how I get inspired. I used to kind of sit back and randomly a concept would pop up into my mind. I still do that, to an extent. I’d say, OK, I need to paint this, and that still happens. But for the most part, I seek my inspiration, because sometimes the way that I used to paint in the past had kind of been sporadic, whereas now . . . I’ve been trying to build a collection. I needed ideas for paintings more quickly than I had been receiving them, so I would definitely go to Instagram and look at different profiles. I’d see something and say, “Oh, this is beautiful, I would love to see this thing in the form of a painting.” I use Instagram to look at different concepts and warp them to fit my style. Q. Speaking of Instagram accounts, you use Instagram Stories frequently on @totsoartsy, relative to regular posts. Do you have a preference toward Instagram Stories? A. I do, because Instagram Stories allow viewers to see things in action, in order of how I painted them. It’s kind of instant. Whereas when I’m creating a regular post, I tend to put more thought into what I post and making sure that I’m saying the right things. Stories allow people to stay tuned with what I’m doing in a timely manner, and I like the organization of the highlights with different categories. I love the idea of being able to click on one thing and seeing fits in that category, versus just a bunch of different images on your timeline. Q. What do you hope your audience takes away from your art? A. That’s a tough question. I would just love for people to see, from my artwork on my Instagram, that everyone has a story. Not everyone’s story is the same — they’re far from the same. I think it’s important that we take the time to look and see what people’s stories are and just empathize with them, no matter what the story is. Just be open and receptive to what people’s stories are. Interview was edited and condensed. Kaya Williams can be reached at kaya.williams@ gmail.com. Follow her on Twitter @Kaya_Noelle.